It is possible and very easy to bring Win-8 control panel to start menu in windows 8 and Windows 8.1! Please press the Windows Key and enter the text control, then you will see the Control Panel Icon, please click this Symbol with the right mouse button. Then you can see the bottom panel with Pin to Start Button. (... see Image-1 Arrow-1,2 and 3) That's it! Next time you click the Windows Logo Key, you will see the Control Panel in Windows-8 start menu! 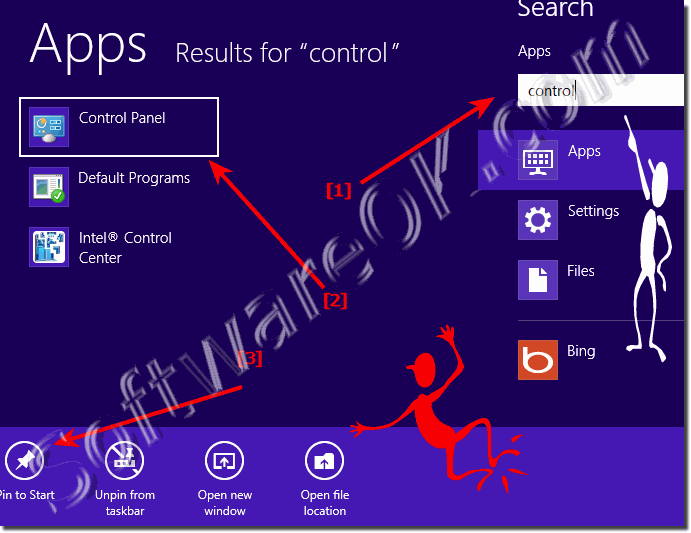 Windows-8 - FAQ-114: How to add control panel to start menu in Windows 8.1/8? On Windows-8 or 8.1 cams to problems if you have an old driver or an old program that was written, for example, for Windows Vista or Windows 7. Can't start Control Panel from Start menu in Windows 8.1? How-to windows 8 enable control panel on start? Start menu for Windows 8.1? Windows 8.1 add program to start menu? Control panel pin on windows 8.1 start? Start menu for windows 8.1 x64 x86? Win 8.1 Control Panel Desktop attach? Desktop Internet Explorer 8.1 on Windows start pin? Internet Explorer 11 attach to start? Add control panel to start menu? Control Panel in the Windows 8 Start Menu? Windows 8 with no right click of the mouse, open the Control Panel in the start? Win 8 and 8.1 Control Panel on the Start menu?